In my newest book, Pizza Day, which will be released by my publisher Tuesday, there is a pizza recipe at the end of the story called Garden Pizza. To win a signed and personalized copy of Pizza Day and its the companion, Soup Day, please go here! Garden Pizza is what a little boy and his dad spend the day making using some of the ingredients that they have grown in their garden. Sadly, we don’t have a stellar garden like theirs, so I made this pizza the other night for my guys using ingredients I bought instead. Some of my sauce ingredients: diced carrots and onion, dried oregano and basil, garlic, tomato, and olive oil (I forgot to include the tomato paste here!). I use the fresh basil as a garnish to top the pizza when it’s done. First I made the dough and let it rest and rise while I cooked the sauce. My sauce gets its sweetness from the carrots. No sugar needed! Plus the carrots add nutrients and fiber. After the sauce cooked down and the flavors melded together, I pureed it in a blender, just like the boy in my book! Then when the dough was finished, I kneaded it, let it rest a bit, and rolled it out. It was time to top! Denis and Jamie just wanted sauce and cheese. I made mine veggie and turkey and used a cauliflower crust I had made (see recipe below), because I was doing reintroductions after the Whole 30 and hadn’t gotten to gluten yet! Then into the oven our pizzas went. 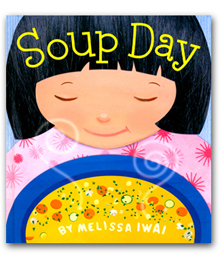 Don’t forget to enter for a chance to win a signed copy of Pizza Day and the board book version of Soup Day here! Spray a large bowl with non-stick spray. Set aside. Whisk together yeast, water, olive oil, and salt in another large bowl until combined. Let sit for about 5 minutes. Add 2 cups of the flour to mixture and mix together until well blended. Add a little bit of the leftover flour gradually (you may use half or all) until dough forms a ball. Sprinkle flour onto a large board or counter top, and dump out dough. Knead for 5 minutes, adding a bit of the remaining flour each time it starts to feel sticky. You want to end up with a smooth, elastic mound of dough. Shape dough into a large ball. Place in greased bowl and turn over to coat with oil. Cover with a damp cloth and let rest for 1 hour. Heat olive oil in skillet and saute onions, carrots, garlic, salt, and herbs until onion is translucent. Add tomatoes and paste. Simmer until softened on very low heat, covered, about 20-30 minutes. Stir occasionally. Pulse in blender or food processor to desired chunkiness. Preheat oven to 450 degrees F for 10 minutes. Divide pizza dough in half, and roll each into a ball. Let rest 10-15 minutes. Lightly dust two baking sheets and a rolling pin with flour. Roll out each ball of dough into a round on each baking sheet. Spoon pizza sauce on top and spread onto each. Top with fresh veggies, pepperoni, cooked sausage, shredded cheese, grated parmesan cheese, goat cheese, whatever you like! Bake for 10-13 minutes, depending how crunchy you like your crust. Prepare two square pieces of parchment, about 6″ x 6″. Place one square on baking sheet and spray with non stick spray; set aside. Mix rest of ingredients together in a bowl. Spoon mixture on top of prepared parchment sheet on baking tray. Flatten into a circle with a spoon. Remove from oven. Place other square of parchment on top of crust and flip. Then peel cooked piece of paper off. Your crust is now ready to be topped with toppings of your choice. After topping, bake in oven for another 5 minutes. Makes one mini pizza crust. January is National Soup Month! It’s gotten colder here, so soup is the perfect go to meal for us. I love soup so much I wrote a book about it. Soup Day was inspired by my son, Jamie. I created Snowy Day Soup (the recipe of which is at the end of the story) to get him to eat his veggies when he was a toddler. We’d choose the vegetables together at the market, and I’d let him cut the soft ones like the mushrooms, with a plastic knife (with my help). Here is an old video of us making it together! Slice zucchini into rounds. Steam. You can either steam on the stove or in the microwave, covered with saran for 8 minutes. Careful transfer the cooked zucchini and juices into a blender. Add chicken broth and seasonings. Pulse several times on low, and then blend at high until completely smooth. 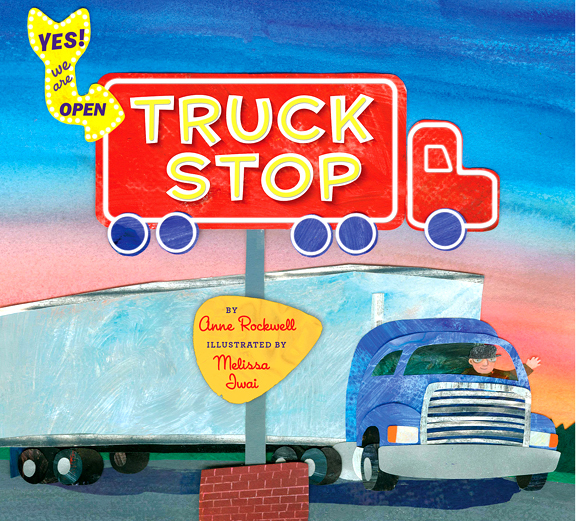 We have a winner for my TRUCK STOP giveaway: Amy from I Found It Interesting ! Congratulations, Amy! I will send you a copy signed by both me and Anne Rockwell, the author. For those of you in the NYC area, this Saturday, June 1, Anne and will be appearing together at BookCourt in Brooklyn (163 Court St. @Dean St.) at 11 am. 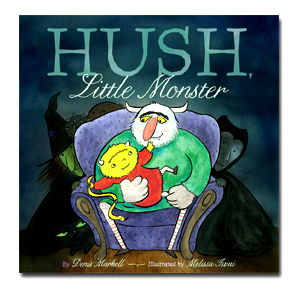 Please join us for a reading, signing, puzzles and treats (mini muffins and mini donuts)! Diligent Dan orders pancakes with syrup and sausages! 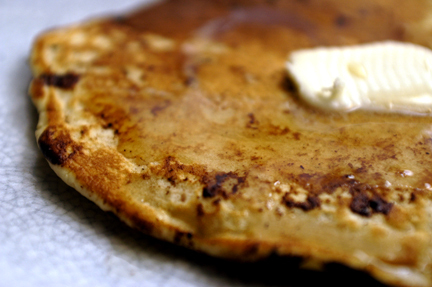 Here is our favorite pancake recipe which my husband, Denis, makes almost every weekend. He’s really perfected it! 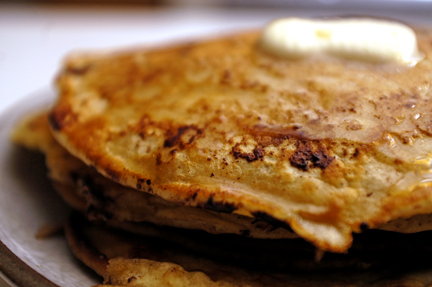 They are mouthwatering right off the griddle. As for the leftovers (if there are any!) we let them cool off, then wrap each individually in saran wrap. Don’t skip this step– it keeps the pancakes from stick together. We freeze these in a ziploc bag. 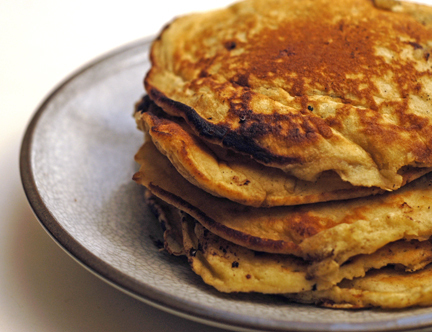 During the week, we can have homemade pancakes for breakfast too. We reheat a frozen pancake (remove saran first!) wrapped in a damp paper towel for 50 seconds in the microwave, and it’s ready to be gobbled up. The best way to cook these is on a griddle because they cook flat and evenly. 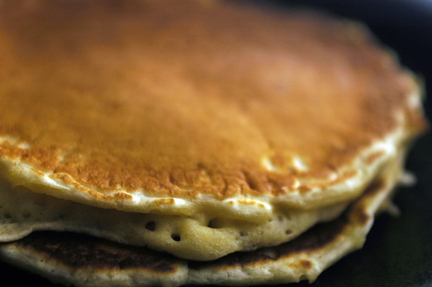 Do not butter the griddle first, or the pancakes will not have that even golden surface. If you don’t have a griddle, use a seasoned cast iron skillet. 2. Mix together the dry ingredients with a whisk. Set aside. 3. Whisk eggs into the milk, then stir in melted butter and vanilla. Whisk this mixture into the dry ingredients until incorporated. 4. Spoon batter onto heated griddle using a 1/3 cup measuring cup. As soon as you see it start to bubble, flip the pancake (after about 30 seconds– it may vary depending on your griddle and how high your heat is). Cook for about a minute. Remove to a plate and, preferably, serve immediately! Who doesn’t love pancakes for a weekend breakfast?? My husband makes the best ones. You may have seen his Cadbury Egg waffles. 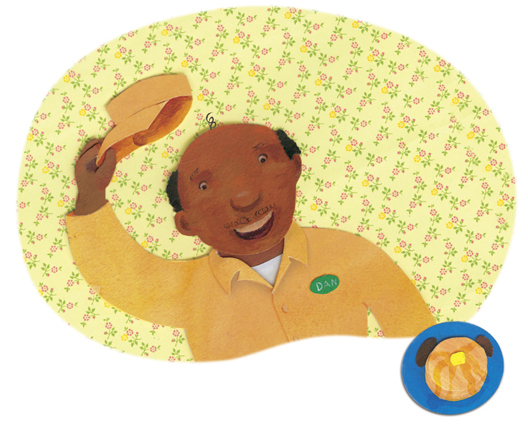 His pancake recipe is featured in a book app I’m very excited to share with you all. 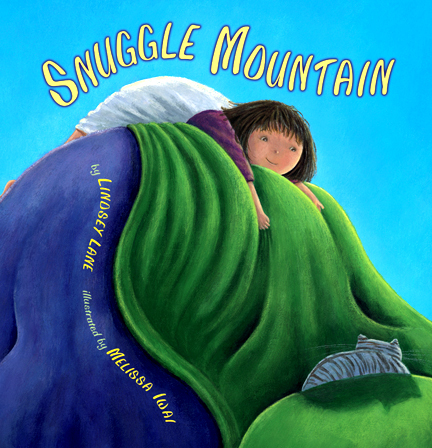 Snuggle Mountain, written by Lindsey Lane, is a wonderful story about Emma, who climbs Snuggle Mountain all by herself to wake up the Sleeping Two Headed Giant which has forgotten all about making pancakes for breakfast. I have to say, I’m really proud of this book app. Lindsey, the author, took the initiative and found a fabulous app producer, Picpocket Books, who agreed to shepherd our joint creation (originally published by Clarion Books in 2003) into the digital age, and they did a wonderful job. One of the aspects of the app version of the book I adore is that the concept of the sleeping giant’s two heads hiding in the bed covers is made very clear with animation. In the original picture book it was quite subtle, and a lot of readers didn’t pick up on it. Check out and download our app at the Apple itunes Store! It is currently on sale for $2.99. It is available for the ipad and will be available for the iphone in a few days. It is the perfect app for young children and gives them a personal interactive story experience. Mix together the flour, baking powder, salt and optional sugar in a medium sized bowl. Beat the egg in another bowl. Add yogurt and milk and beat together. Then stir in melted butter. Add this mixture to the bowl of dry ingredients while stirring. Heat a skillet or griddle over medium high heat on the stove. Grease skillet. Pour batter into pan when it is heated. Brown the bottom in 2 to 4 minutes, then flip and cook other side for about a minute. Serve immediately. Pancakes can also be kept warmed on an ovenproof plate in a 200 F oven.